I’m here today with my friend Jeff from Coastal Acupuncture and Wellness. Jeff is a Registered Acupuncturist and has been in practice since 2000. He is a licensed member of the College of Traditional Chinese Medicine Practitioners and Acupuncturists of BC. If you suffer from poor digestion, upset stomach, overactive or underactive digestion Traditional Chinese Medicine, or TCM can help you understand the root of the problem. According to TCM any condition can either be “deficient” or “excess” in nature. Once you know if a symptom is excess or deficient you can treat it using acupuncture, herbs, foods, massage, yoga, and qi gong. In TCM all symptoms have a root “organ” or meridian that is mainly affected. This could be the lungs, heart, liver, kidneys and so on. Any symptom related to digestion is connected to the stomach and spleen system. Then you most likely have a deficient pattern. **Always consult with a practitioner of TCM or acupuncturist for an accurate diagnosis. 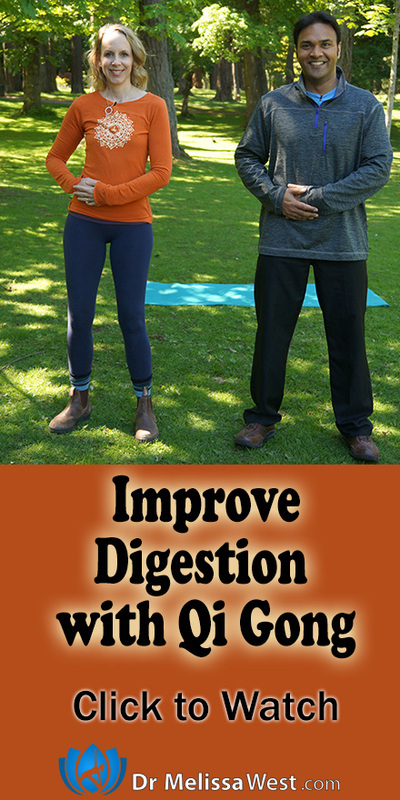 In this video Jeff shows two qi gong exercises that help with your digestion whether you have an excess or deficient pattern. TCM Uses of concept called the orary clock. This concept suggests that there is an ideal time to tonify a deficient condition or sedate an excess condition. The best time to balance the stomach is between 7 a.m. and 11 a.m. Try to do these exercises everyday. And if you would like a handy downloadable Traditional Chinese Medicine clock that shows you not only the best time of day to improve digestion, but also some other important times of day related to health problems you may be experiencing then click below. Today’s question for the comments is, How has yoga helped you with your digestion? We would love to know.